Two of my favorite brands in their category have launched their new products recently. In South Australia, mussels are mainly grown in aquaculture farms in Eyre Peninsula near Port Lincoln. Whenever thinking about these natural beauties, I always prefer my mussels to be from Kinkawooka. 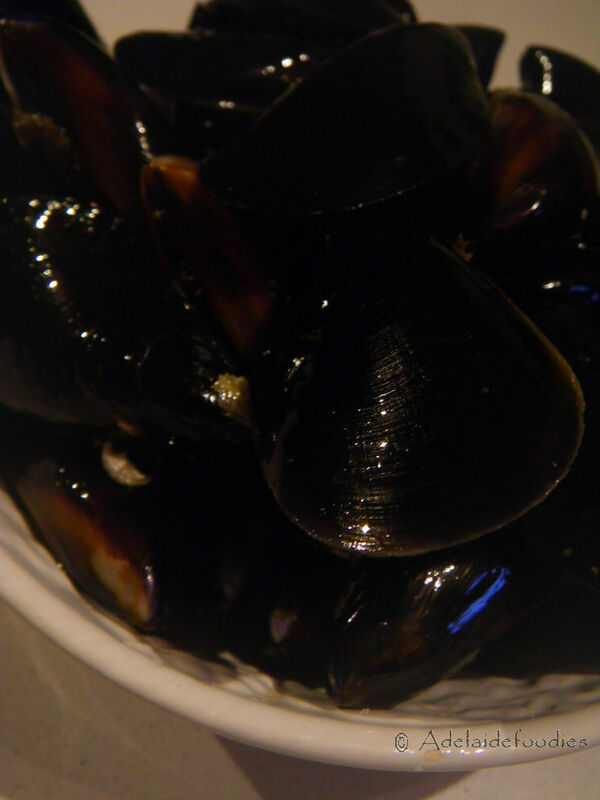 Mussels are versatile in cooking and can always be suitable with different cuisines and cooking method. 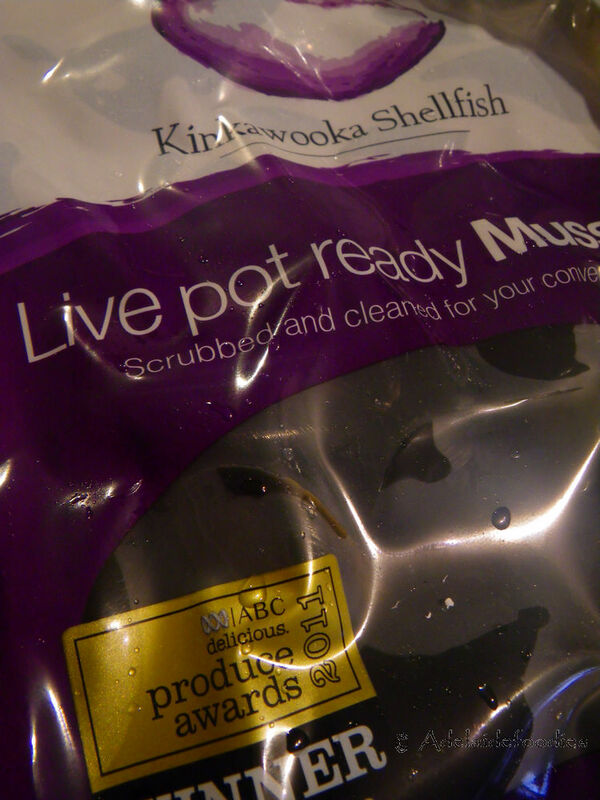 Kinkawooka mussels are even better in taste after cooking as the mussels are kept live in sea water in the package. This ensures that after a short period of cooking , tender and fresh mussels can be at your table. 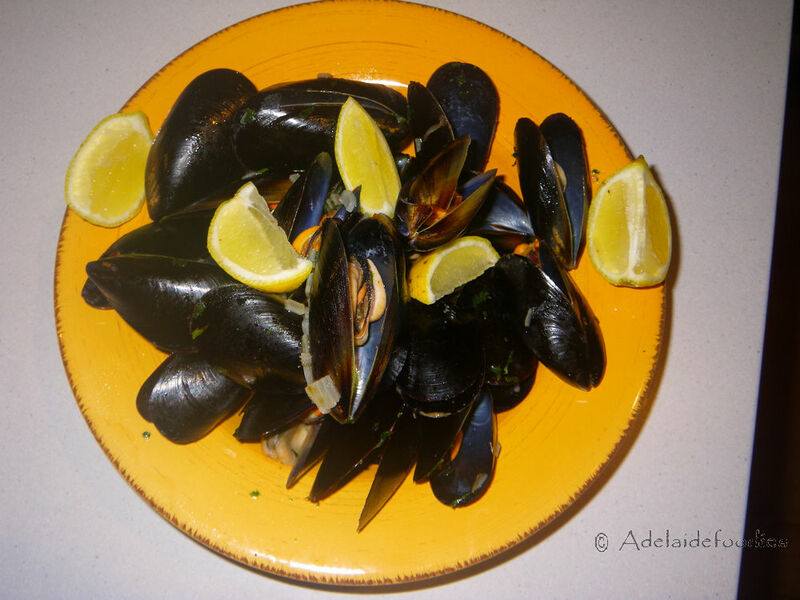 You can read my review of Kinkawooka mussels here. What Kinkawooka introduced in June was their new season Petit Bouchot mussels. As the name suggests, these mussels are small in size. They had a wonderful cooking demo/ tasting event at Adelaide Central Market on June 13, 2014. I was among the first several people there tasting their new product. 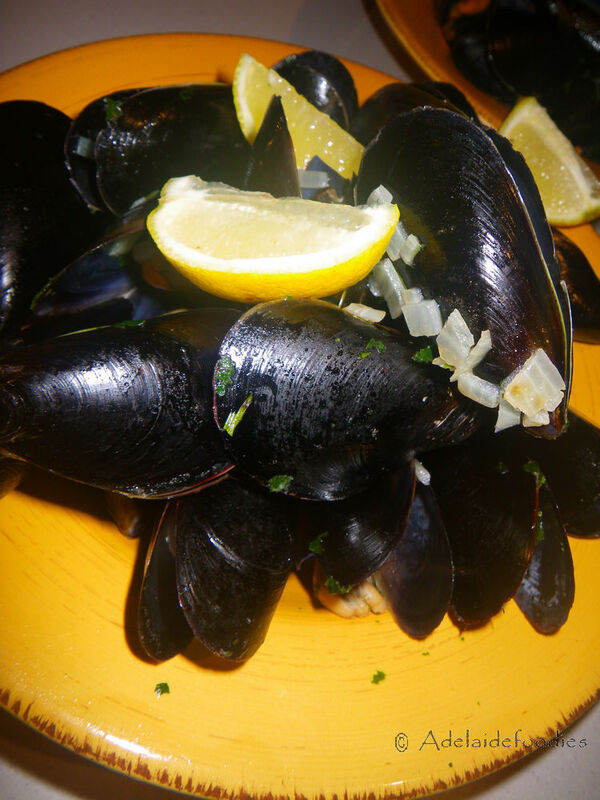 The experience was fantastic with the mussels being well cooked, tender and extremely flavourful. In the mean time, my favourite international cider brand, Rekorderlig, launched their “Orange and Ginger Cider”. I came across the brand several years ago at the good food and wine show when it was first introduced to Australia and Tina and myself basically just felt in love with the cider for its refreshment and fruity flavours. 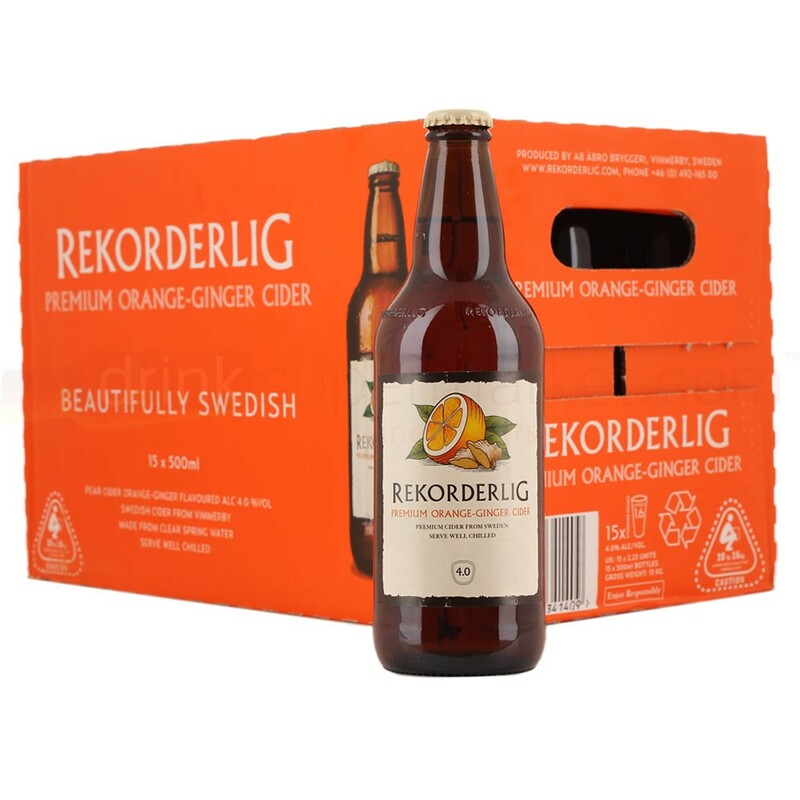 The new orange and ginger cider, as all Rekorderlig ciders, should be served cool so it can be really easy to digest while not many alcoholic tastes are left in the mouth. The new cider exhibits strong orange flavours, combined with the ginger spiciness. However, the magic chemistry did not stop here. I even detected some star anise and cinnamon combination on palate, making the cider extremely enjoyable. Since both of them launch around the same time and I’ve got both of them at home, I thought I might do something to connect these two great products. 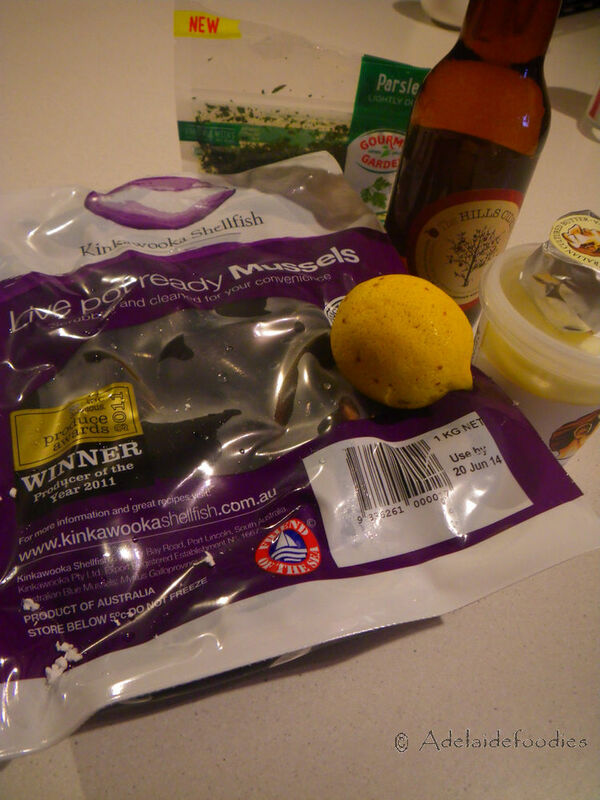 So, here you go, my own recipe, Cider Steamed Kinkawooka Mussels w/ Pepe Saya creme fraiche. 1. Combine the apple cider and the Rekorderlig orange and ginger cider. Boil the cider together in a sauce pan until effervescence ceased. 2. In a pot/sauce pan, add the olive oil and put the stove on high heat. Then, add the finely chopped onion and cook until soft and golden brown. 3. Add the butter and once it all melt, add the mussels in and stir. 4. Add the boiled cider mixture into the pot and cover the top to cook for 3-4 minutes until all mussels have opened their shells. 5. Add the semi-dried parsley and stir. 6. Now, the mussels can be plated. 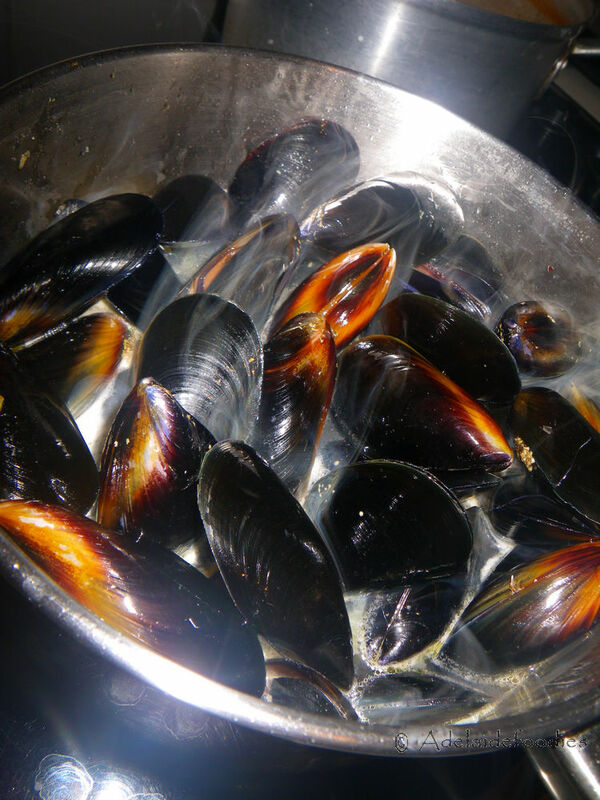 Spoon the mussels into a bowl/ or plate and squeeze some lemon juice on top of the mussels. If you don’t like creme or dairy, then the mussels can be enjoyed at this point. However if you prefer to have some creaminess added into the plate, please continue to read. 7. Drain the soup in the pot through. Discard the remainders. Collect the soup in a glass bowl and transfer 2/3 of the soup back into the pot. Put on high heat. 8. Add a tub of the creme fraiche and stir until the liquid gets thicker. 9. Once the creamy soup gets smooth and consistent, squeeze a lemon wedge into it. 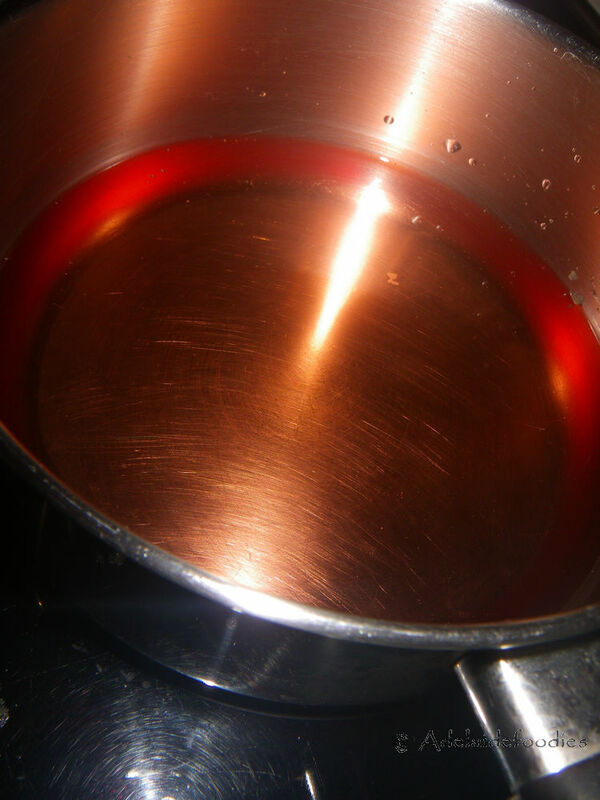 Stir and let the liquid become consistent again. 10 Spread over the mussels with generous amount of the creme fraiche liquid and serve with crusty break. 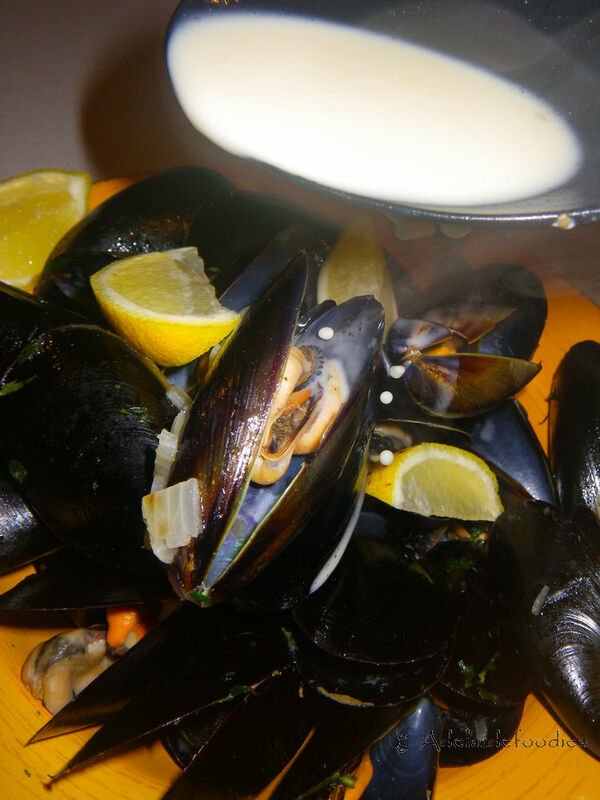 At any point of time, the creme fraiche can be added more to the mussels. The dish tasted brilliantly. 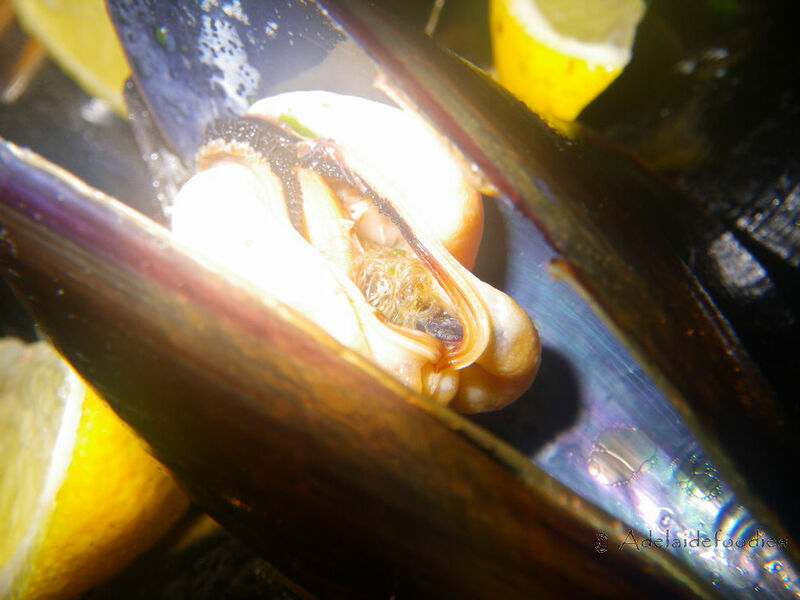 The mussels’ full freshness and seafood flavour have been well reserved in the meat and made it extremely tender and flavoursome. The meat maintained their original size. 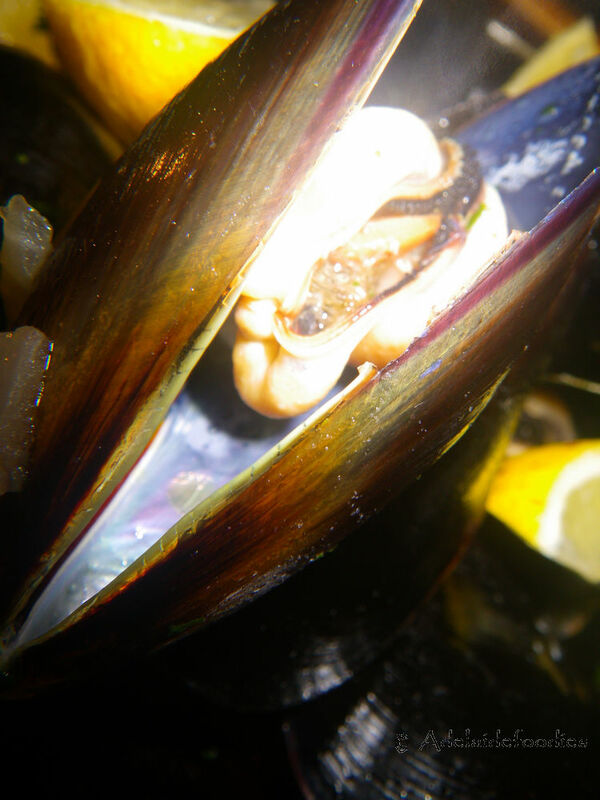 The boiled ciders were eliminated with the alcohols and hence all the essential key flavours have diffused into the mussels’ meat, providing it with complex layered flavours. It’s like an fresh spicy mussel dish without any spices but one can definitely find the ginger flavour all over the place with the flavour of the mussels being promoted and enhanced. The soup was super sweet too! 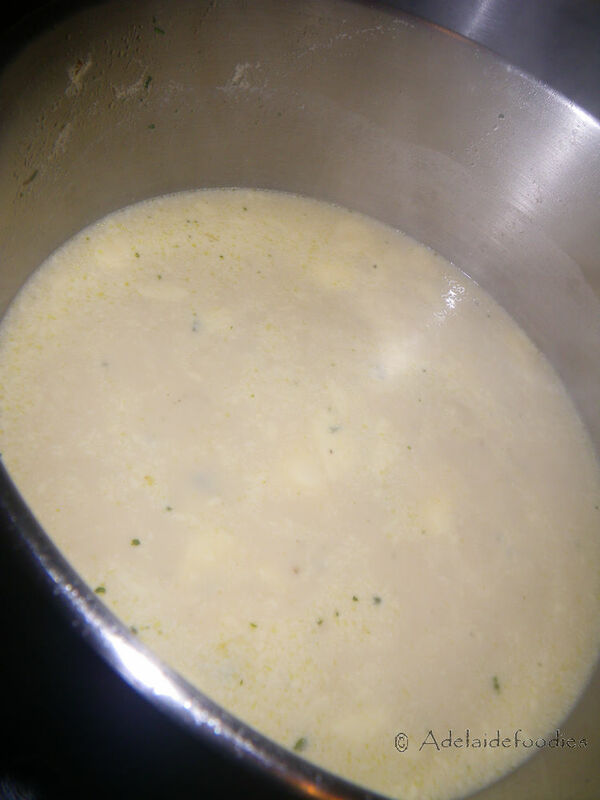 With no salt added, the natural saltiness from the mussels and the cider made the soup very tasty. I am sure one can finish all of the soup with breads :D. The addition of the creme fraiche was a good idea because now, on top of all the great flavours, extra creaminess with silky textures are introduced to the dish. These flavours worked together with each other quite well and in turn, complemented the mussels both in texture and in flavour. G’day! Looks to be a great recipe Xin! That the mussels are already cleaned, is a bonus for me! How come every time when I cook mussels, they are always over cooked? Make sure you only cook them until just open. Otherwise the flesh will be tough. The dish looks great! How much did the mussels cost? I don’t know the price now but should not be over $10.